Sherry"s Stamped Treasures: I LOVE my Big Shot! I LOVE my Big Shot! So many of you have heard me say it time and time again - what did we do before the Big Shot?! 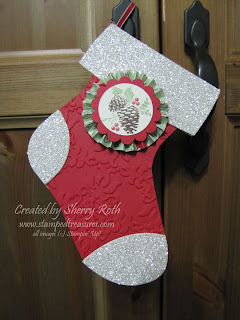 Take a look at this great project that I created using the stocking die from the Holiday Mini Catalogue. 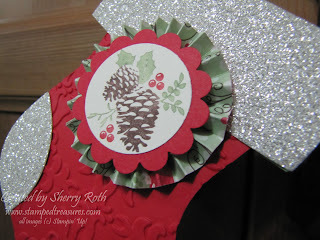 And how about that silver glimmer paper - so beautiful! To step it up even more, I used our new Simply Scored tool to create the little rosette. These little beauties are perfect for tucking a little treat inside, a gift card or even a little tag with a message. I plan on making several of these this year. Have you heard that you can get a Big Shot absolutely FREE (or $125 in free product)? Take a look at this video and then contact me if you have any questions. If you are interested in more info, you can visit my demonstrator benefits page or contact me, I'd be happy to provide you with all the information you need.